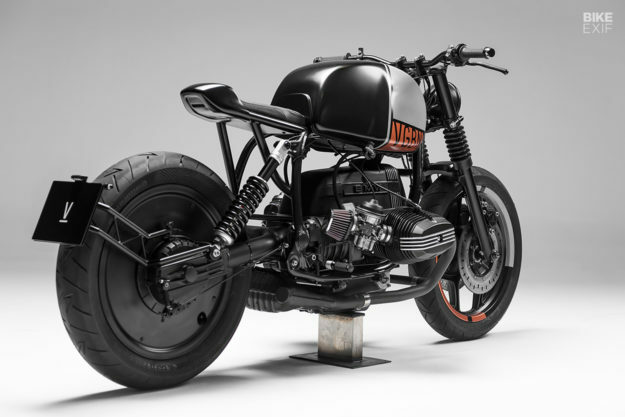 BMW airhead customs are like AC/DC songs: after a while, it’s hard to tell them all apart. And that’s not necessarily a bad thing, because the style is usually pleasing to the eye. 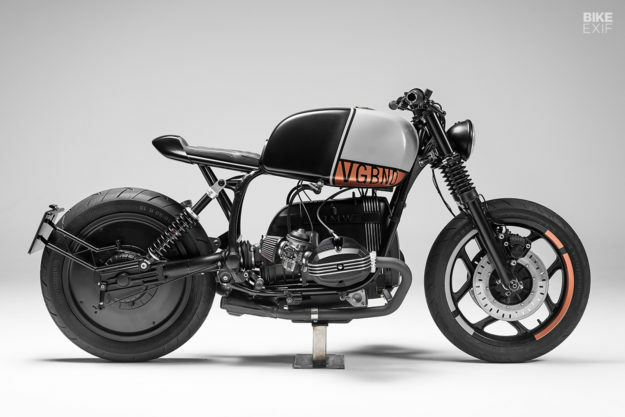 But no one could ever accuse Vagabund Moto of following a conventional formula. 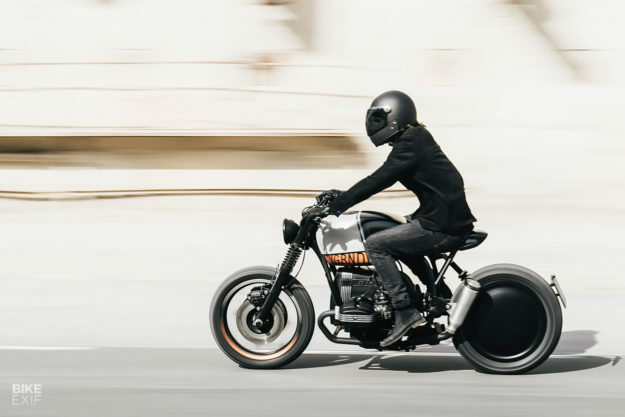 Their approach is unique and their bikes buck the mainstream trend. 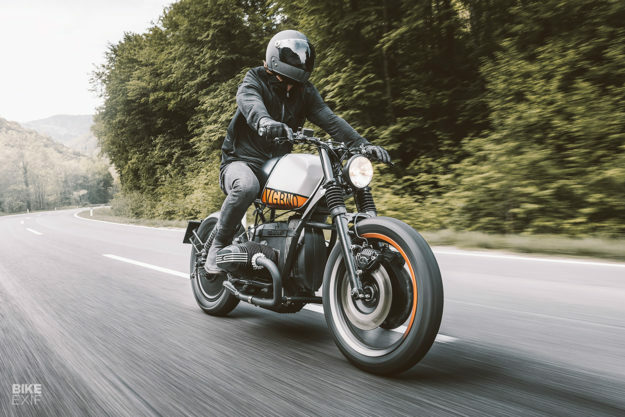 So it’s ironic to learn that the owner of this razor-sharp R80 asked Vagabund to replicate the style of a custom R80 they finished two years ago. The pair started out with a relatively fresh classic tourer: a 1992 R80 RT with only 25,000 km on the dial. And thanks to BMW’s historically good build quality, there wasn’t much engine work needed. Getting the striking Vagabund ‘look’ meant ditching the bodywork though, apart from the fuel tank—but even that’s not quite original. The back end of the tunnel has been closed off, where the gap would normally be blocked by the bulky OEM seat. Just behind it is a svelte new perch. Vagabund designed the tail hump digitally, then got it 3D printed. It means they could pack a ton of detail into a small space—from the multi-faceted upholstery by Christian Wahl, to the sculpted recess under the tail that hides an LED back light. 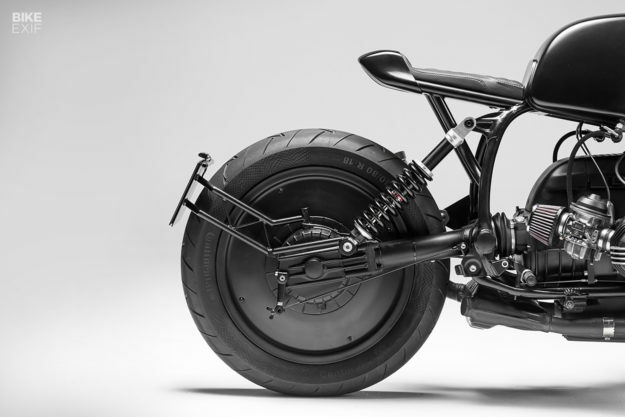 Everything sits on top of a custom-made subframe, and the main frame’s been liberated of any unneeded mounts. The rear’s now propped up by a new YSS shock. The wheels are stock, but the rear’s clad in a pair of glass fiber-reinforced plastic covers. Up front, Vagabund shortened the forks by 60 mm, milled and powder coated the lower legs, and added a pair of fork boots. 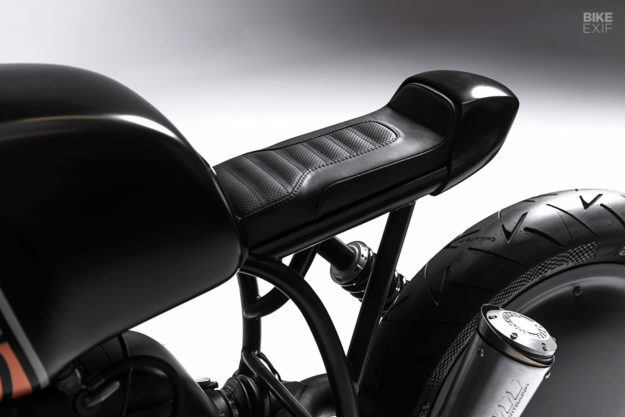 There’s a custom-made top triple clamp too, playing host to an integrated Motogadget speedo. The handlebars are from LSL, and have been trimmed down. 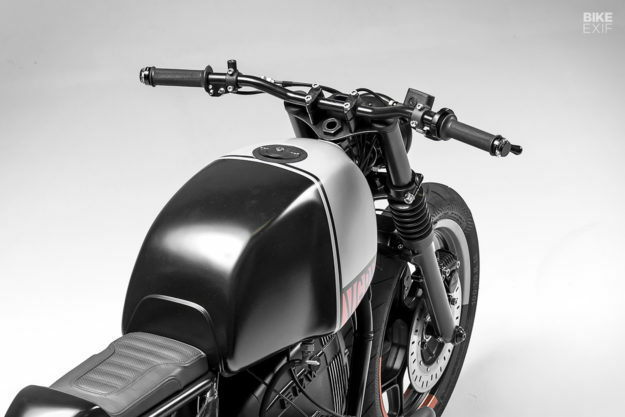 They wear a Grimeca master brake cylinder, a Domino clutch lever, and custom switches in a 3D-printed housing. There’s a small headlight out front, and a pair of Motogadget bar-end turn signals. The rest of the bike’s been treated with equal consideration. It’s sporting a set of Continental ContiRoadAttack tires, K&N filters, and a Supertrapp muffler attached to the modified stock headers. And then there’s that striking livery, quite unlike any other we’ve seen, and expertly applied by Graz neighbors i-flow. But it’s what’s missing that’s just as important: there’s no mess of wires vying for your eye’s attention. The bike’s been totally rewired, with a new diode board and two tiny Ultrabatt lithium-ion batteries, hiding under the tank. 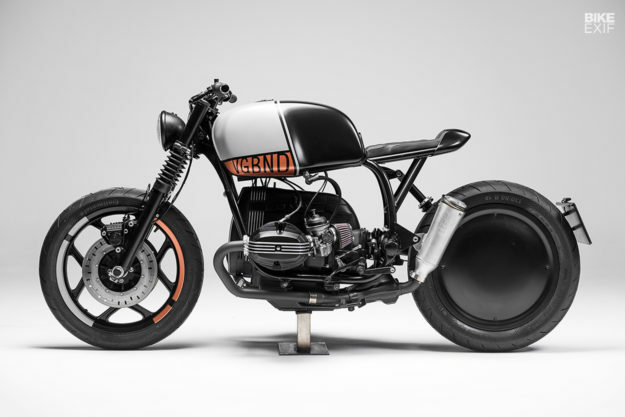 Despite the sano approach, this BMW is completely street legal in Austria. 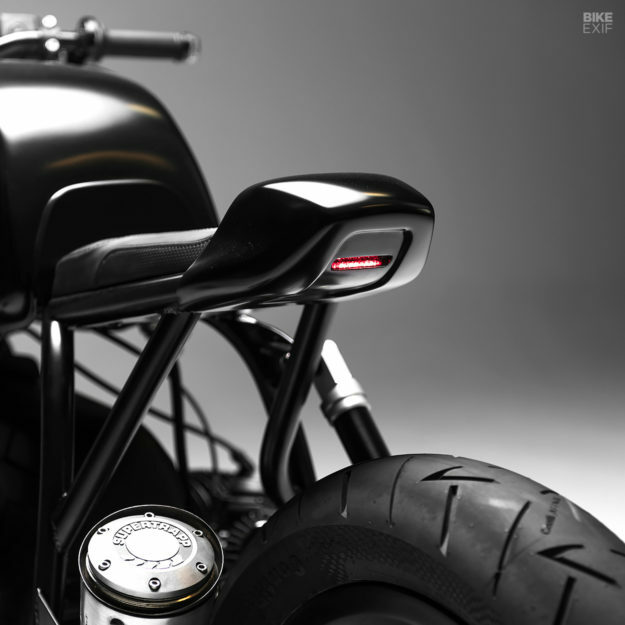 On top of the usual lighting, there’s a license plate bracket at the back that holds a pair of tiny Motogadget turn signals—with just the right amount of visibility to check legal boxes. Titled ‘V09,’ this BMW leaves us thunderstuck. 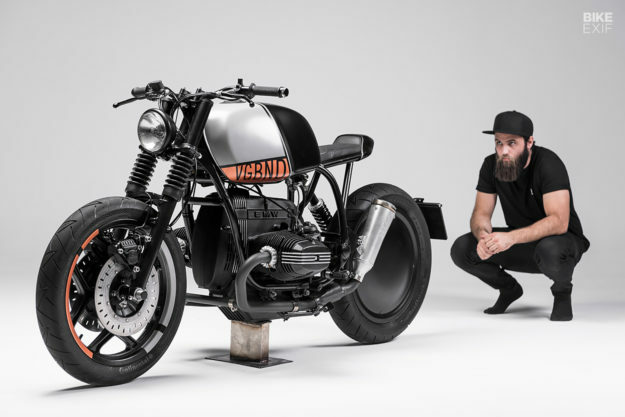 It hits the mark with its stance, proportions and finishes—so we’re counting it as another win for the Austrian duo.